“I drew a square, then made it 3D and rotated it … and I thought, bloody hell, this is marvellous!” Graeme, better know as Willo, recalls. “The traditional method of roof framing needs some pretty complex geometry,” Willo says. “Over the years most students and teachers have not gotten into it and we’ve lost that traditional skill in favour of pre-made components. “In the old days we’d give it our best shot in the theory stage and then go into the workshop and basically start again – every student would need guidance to get on track. “With SketchUp we can cover the theory in 2-3 hours by drawing models of what we will build so when we get into the workshop the job’s largely done. 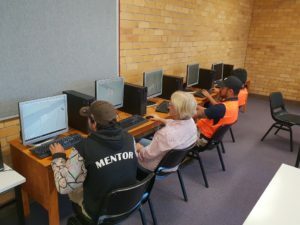 “That’s not to say some students don’t need help as they go along, but as they’ve created 3D models they can see what’s what, they can problem solve more easily and they know before they set foot in the workshop if their design is going to work in real life or not. Willo said SketchUp also meant students could tackle projects previously out of reach. “We are now not constrained by physical resources,” Willo said. “Our students can create large roofing projects in 3D that we could never do in real life because we don’t have the room or the materials. “The thing is, if you work in simulation, good simulation, it makes it real. “I say to people; the RAAF doesn’t put its new pilots straight into an F/A18 – they use simulators. So does Qantas with its pilots – no-one flies an A380 straight out of school. “In the past we were dealing with Trimble in the US, he said. It is great having a local company in BuildingPoint for the purchase and maintenance of our SketchUp licences and for the on-going support that we desperately need. “Just having someone who can work in metres and millimetres rather than feet and inches is a real bonus and I can’t overstate the value of being in the same time zone when you need help in a hurry.